Drama is one of the many notes that costume jewelry excels at playing. A sudden pop of color or a bold, sweeping line; the juxtaposition of an impressive jewel surrounded by a supporting cast of tiny sparklers, or the finishing drop in a cascade of metal and gems –all convey a sense of the dramatic without the kind of price tag that will have you enduring a financial drama of your own. Turquoise, with its sunny undertones and associations with the arid plains and gentle folklore of the American Southwest, might not signal drama on first thought. But just as the Southwest breaks through its relative calm with bold and dazzling sunsets that burn through the sky each night, so too does turquoise harbor the capacity to light up the eyes and tantalize the jewellery-loving mind. 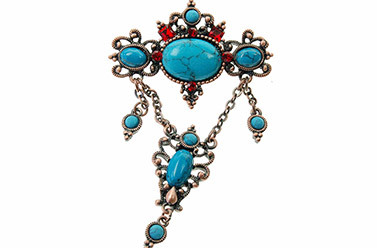 Our stunning turquoise brooch with ruby red “siam” Swarovski crystals demonstrates this double nature beautifully. Composed in a classic, balanced design that recalls the fashions and fancies of Victorian England, this brooch is the perfect complement to a coat, sweater, blazer lapel, or anywhere you want to show off your style with both refinement and a surprising punch. 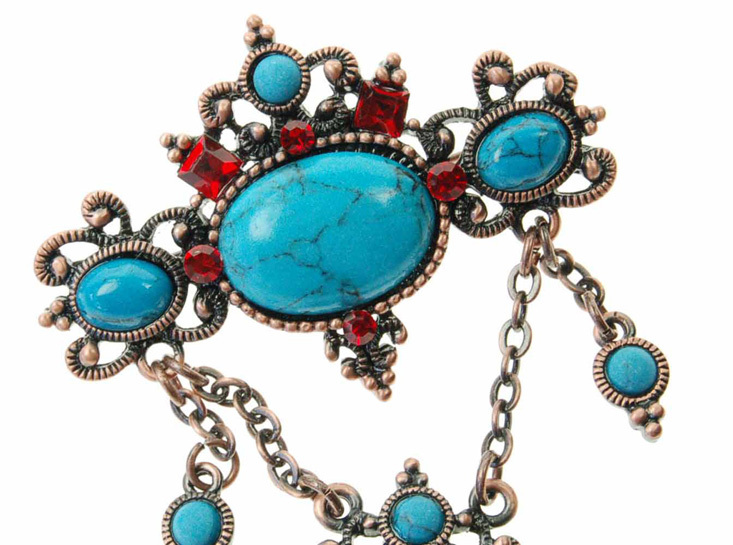 This punch comes from the assortment of tiny crystals that surround the central oval turquoise stone. These crystals, dubbed “siam” Swarovskis, imbue the piece with a deep and rich jolt of red in six itsy-bitsy stones, varying from square to round cut. They impart an elegant and eye-opening contrast to the brooch as a whole, and are sure to please the call for interesting, provocative jewelry. Providing the backdrop for this startling scene of reds and blues are several quality turquoise stones, both in oval and round cuts, with varying degrees of polish and shine. The characteristic dark veins vary from piece to piece and add a sense of the unique to every brooch. These stones exhibit the old-fashioned and much-loved brilliance of true turquoise blue, calling to mind impeccable tropic waters and storybook afternoon skies. This graceful counterpoint of stones is set into an intricate and endlessly appealing triangle of filigree and scroll work, finished in a brass patina that adds a lovely and full-bodied glow to the brooch. The central stones are arranged across a horizontal and stationary plane where the brooch is pinned to the garment of your choice, while a chain link strand connects a focal drop and two smaller, shorter falls of metal and turquoise to either side. Throughout the setting, tiny finials of metal and subtle, antiqued notches add interest and texture, and the mobility of the three jeweled drops allow the piece to sway slightly with the wearer's movement. This piece is an excellent gift for yourself or your favorite brooch lover, and a testament to finding beauty in unexpected combinations.